Does the invasive Lupinus polyphyllus increase pollinator visitation to a native herb through effects on pollinator population sizes? Invasive plants may compete with native species for abiotic factors as light, space and nutrients, and have also been shown to affect native pollination interactions. Studies have mainly focused on how invasive plants affect pollinator behaviour, i.e. attraction of pollinators to or away from native flowers. However, when an invasive plant provides resources utilized by native pollinators this could increase pollinator population sizes and thereby pollination success in natives. Effects mediated through changes in pollinator population sizes have been largely ignored in previous studies, and the dominance of negative interactions suggested by meta-analyses may therefore be biased. 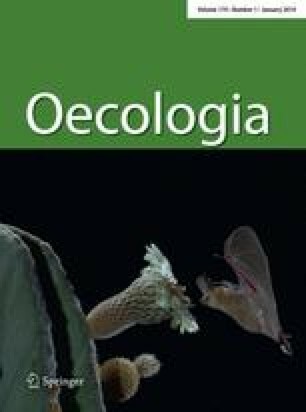 We investigated the impact of the invasive Lupinus polyphyllus on pollination in the native Lotus corniculatus using a study design comparing invaded and uninvaded sites before and after the flowering period of the invasive. We monitored wild bee abundance in transects, and visit rate and seed production of potted Lotus plants. Bumblebee abundance increased 3.9 times in invaded sites during the study period, whereas it was unaltered in uninvaded sites. Total visit rate per Lotus plant increased 2.1 times in invaded sites and decreased 4.4 times in uninvaded sites. No corresponding change in seed production of Lotus was found. The increase in visit rate to Lotus was driven by an increase in solitary bee visitation, whereas mainly bumblebees were observed to visit the invasive Lupinus. The mechanism by which the invasive increases pollinator visit rates to Lotus could be increased availability of other flower resources for solitary bees when bumblebees forage on Lupinus. Communicated by Christina Marie Caruso. We are grateful for many constructive comments on the text from professor J. Ågren and two anonymous reviewers. We also thank P. Börjesson for statistical advice. The study was financed by grants to A. Jakobsson from the foundation Oscar and Lilli Lamms Minne and the Swedish Research Council for Environment, Agricultural Sciences and Spatial Planning. The experiments comply with the current laws of Sweden in which the experiments were performed.